Jesus who is God in the flesh said, “my God, my God, why have you forsaken me?” Every Christian goes through times where it feels like God has abandoned them. It feels like He has left us. We think that He’s mad at us. We pray and we pray and still nothing. When you first put your trust in Christ for salvation you feel pumped. You have joy. You feel a close connection with God and then as time goes on God distances Himself. When doing God’s will you will go through trials. Many times you can’t see what God is doing, but sometimes you can. Rejoice in the fact that you are praying to God more than ever. You truly see that without Christ you have nothing. You hold on to Christ and you stand firm in faith. God will work in your life for your good and His good purposes. You won’t go through trials forever. No one said the Christian life will be the easiest. Ask David, ask Job, ask Paul. You will go through trials, but you can rest assured that God will not lie. 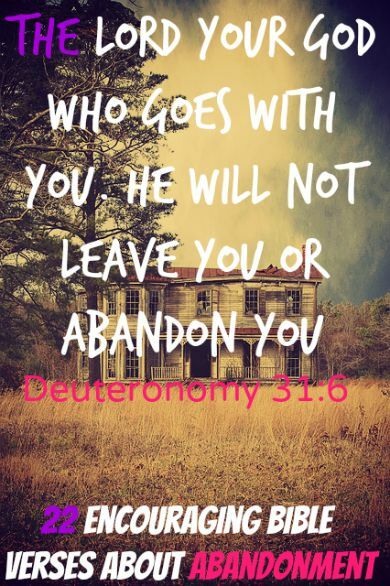 If He said He won’t leave you, then no matter how bad your situation may seem He won’t leave you. Trust in Him and know that He loves you and remember that all things work together for good. In life when everyone else abandons you God will never. Continually build your prayer life and pour your heart out to Him. He will help you and you will see the goodness of the Lord. How we may feel at times. Trials are for your good. You may have times in your life when it seems that He has forsaken you, but He will never forsake His children. Trust in God not your circumstances. Never stop crying out to God.